Occidentalism » Blog Archive » Does anyone find this cartoon funny? Does anyone find this cartoon funny? Naver News posted the following Seoul Shinmun cartoon (which has now been replaced) on its site, here, at 20:48 on April 17, 2007. 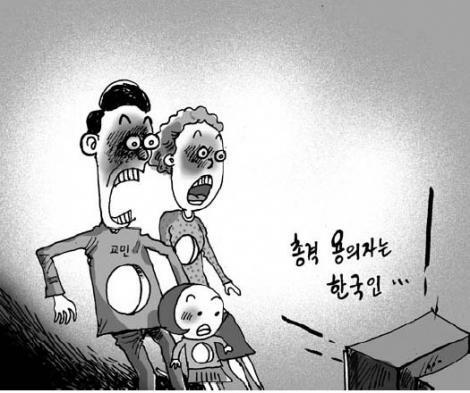 In its rush to take a jab at the United States, the newspaper posted the cartoon before it knew that it was a Korean citizen who had done the shooting. Now that they know, I wonder if they are still snickering? In one bang, 33 people….This reconfirms the superiority of our gun technology. Wow, Koreans are sure fast drawers. 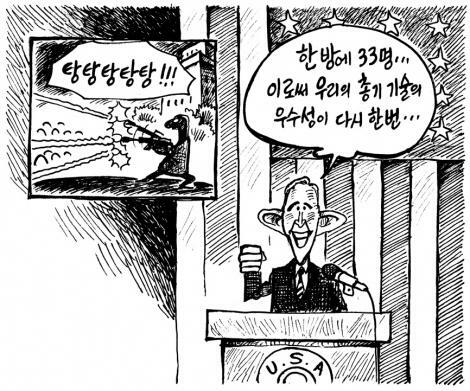 Below is a link to more Korean cartoons taking jabs at the US because of the shootings. Again, I believe the following cartoons were also drawn before Koreans realized that it was a Korean that did the shooting. Thank you for providing me the link. I read some of the comment through machinary translation. I don`t know why but the earliest comment I could see was “wolfst***2007-04-17 23:16:42”. Maybe the earlier ones were deleted when the cartoon was replaced. At least the one who commented at “전*2007-04-17 23:45:26” seems know that the killer was Korean, so the comments that I could see was written after they knew the nationality of the killer. I wish I could see the criticism written before they knew that. I feel so sad and disapointed by them. Anyway thanks. Sorry I misunderstood. I mistook AM and PM. I don`t know why but the earliest comment I could see was “wolfst***2007-04-17 23:16:42″. Maybe the earlier ones were deleted when the cartoon was replaced.